M. Bindhammer won an award for the Assistive Technologies category of the 2016 Hackaday Prize contest for designing an open source Arduino shield that can measure blood glucose level using electrochemical test strips. 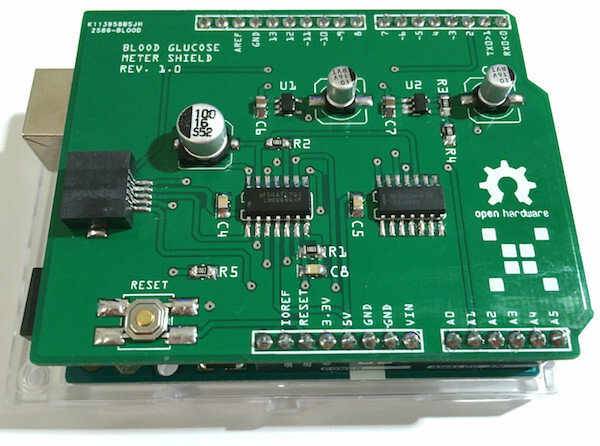 His glucose meter shield receives the blood sample through a One Touch Ultra test strip and prints out the glucose level on the Arduino IDE serial monitor window. Here is a demo video of the glucose meter shield. Typically the electrodes are coated such that an enzymatic chemical reaction occurs at the electrode surface and this reaction dictates the resulting current. The details of the electrochemistry can be quite complex. Since commercial strips are used, the details are somewhat unknown as the companies do not release detailed data about their particular test strips operation. Some devices apparently watch the current after a short initial transient (the current will level out to some degree) and then report the current after a fixed time. Another principle looks at the total amount of reaction which has occurred and thus integrates the current with respect to time to obtain the total amount of chemical reaction which has occurred. Our glucose meter will make two measurements to determinate which relates more strongly to the glucose level: one is the current after a fixed time and the other is the total integrated current. Our RGB matrix panel driver shield for Arduino Uno has been slightly revised. The shield now also carries the DS1307 RTC chip on board along with a CR1220 coin cell battery holder on the back. It is applicable for driving popular 16×32 RGB matrix panels with HUB75 (8×2 IDC) connectors. Row and column driver circuits are already built on the back side of these matrix panel. The data and control signal pins for driving rows and columns are accessible through the HUB75 connector. It requires 12 digital I/O pins of Arduino Uno for full color control. The revised version also has a slide switch (SW1) to select the source of the 5V input to the Arduino Uno. If it is in ON position, the 5V input from the DC barrel jack of the shield also goes to the VIN pin of Arduino Uno. 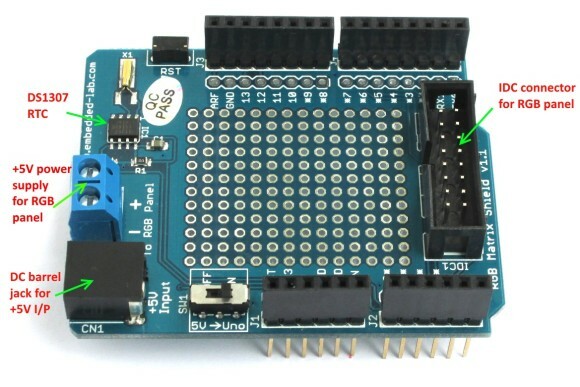 In this case, Arduino Uno does not need to be powered separately as it gets from the shield. 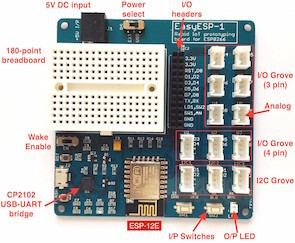 If the switch is in OFF position, the Arduino Uno must need its own power supply, which could be from an USB port or an extra DC wall adapter connected to the Uno board. We sell the display module, the RGB driver shield, and connecting wires as a kit at our Tindie Store. Outside the United States, you can also purchase it from our Elecrow Store. The DS1307 RTC chip’s I2C bus is pre-wired to the Arduino A4 and A5 pins on the shield. This display module is fully compatible with Adafruit’s RGBMatrixPanel Library. 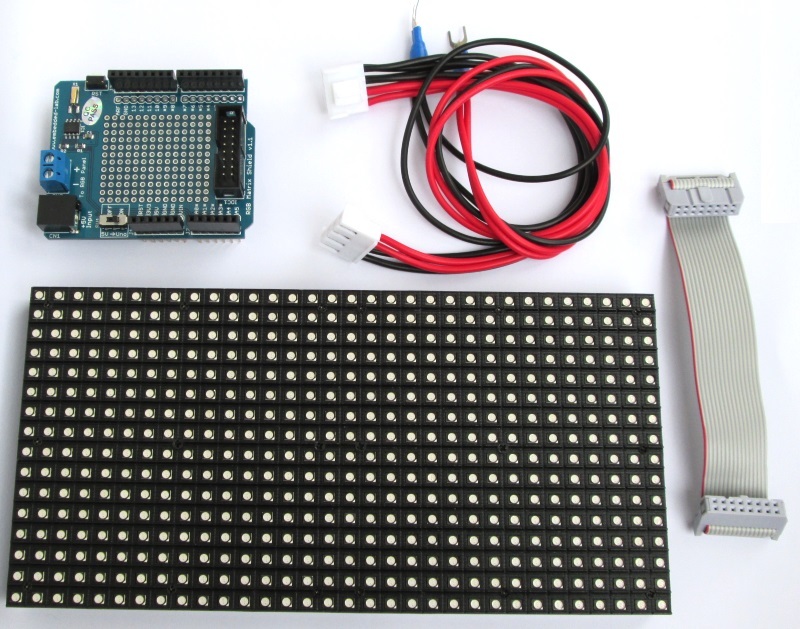 Note that the power supply required to power the LED panel is not included in the kit. You will need a regulated 5V DC power supply with enough current sourcing capability (~2A) to power the RGB panel. More details on the external power supply can be found in the hookup guide (link provided above). 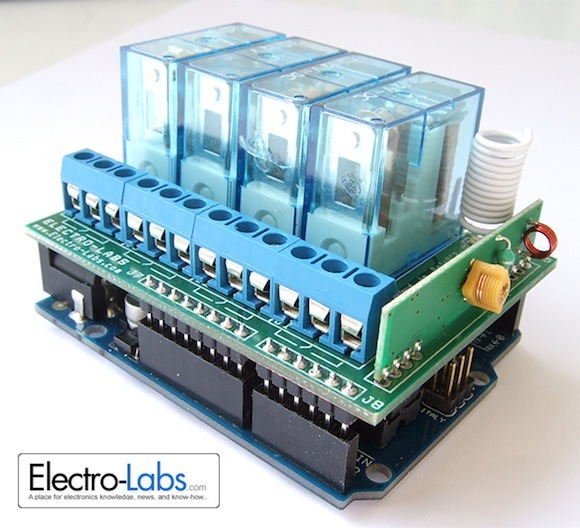 Electro-Labs has posted a new project about making a programmable lithium battery charger shield for Arduino. The shield schematic and printed circuit board are designed using the SoloPCB tools, a Windows-based PCB designing tool from FabStream. 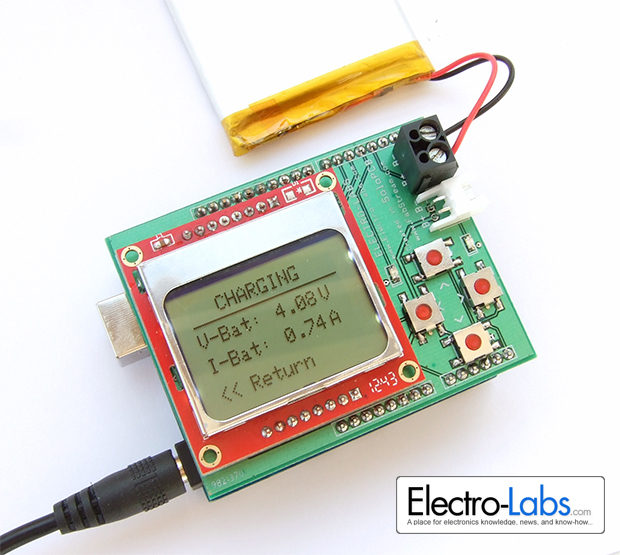 The charger shield consists of a Nokia 5110 LCD and four tact switches for user interface, which allows users to program the charging voltage and current. Their design also features the ability to monitor the battery status before and during charge. The circuit is based on LT1510 Constant Current/Constant Voltage Battery charger IC from Linear Technology. LT1510 uses the PCB ground plane as heat sink during operation. The four tact switches allows user to navigate through various features, which include setting the battery cut-off voltage and the maximum charge current, check the battery status, start and stop charging, etc. The charger stores the last set charging thresholds into Arduino’s internal EEPROM, so that at next startup the user don’t have to enter these values again. This lithium battery charger uses Arduino analog input pins A0 and A1 to sense the battery voltage and the charge current, respectively. 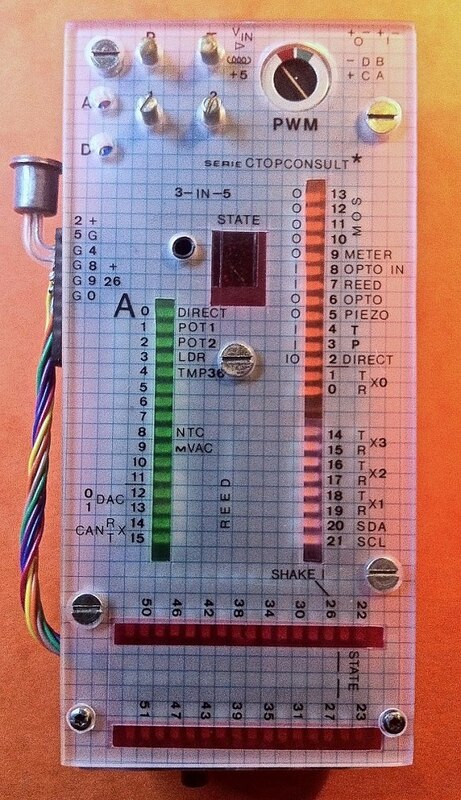 Carsten Tonn-Petersen has designed this Arduino pin monitor and tester shield to assist his prototyping work with Arduino. 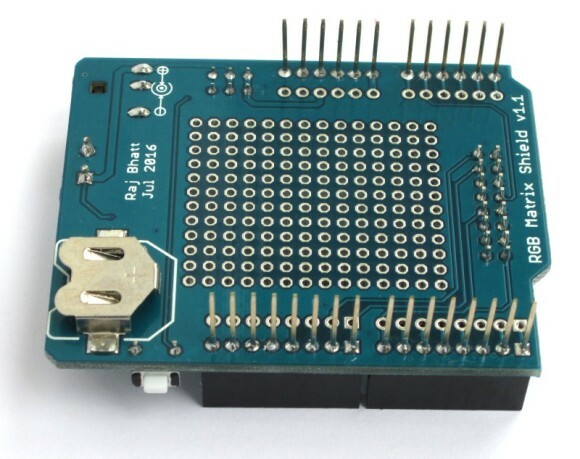 The key features of this shield is it provides one LED for every single I/O pin and can be used with Arduino Uno, Leonardo, Mega, Due, and Mini. The shield also features one tact switch and one toggle switch for digital inputs along with two potentiometers for simulating analog input voltages during prototyping. Can be used with Uno, Leonardo, Mega, Due, Mini, etc. LED’s grouped in 16 for analog I/O, 14 for digital I/O/PWM, 8 for digital I/O/Tx/Rx and 32 digital I/O. In total 70 LEDs. All LEDs are very high efficiency white SMD types with coloured film on top, according to the group. 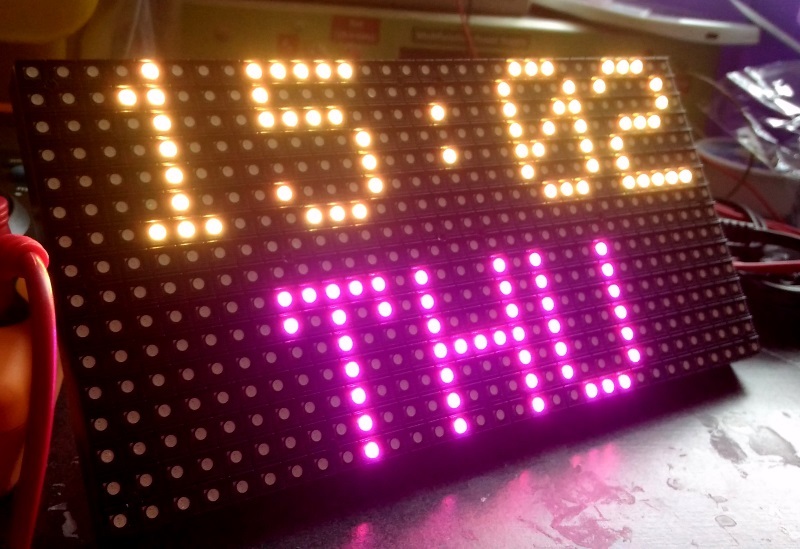 The LEDs cathode reference can be adjusted down to -2V: LEDs will start to light up when pin voltage goes positive. Visit Carsten’s project page for more details. If your next Arduino project needs some kind of remote switching control, this DIY 433MHz RF receiver plus relay shield might be useful for you. It includes a 433.92Mhz RF receiver and four SPDT relays, which allows you to perform wireless control of the devices connected to the relays. Each relay is capable of switching up to 10A @ 250VAC mains power supply.